Hario white ceramic cones come in a few sizes. The 2 cup cone size seems to be developing into the de facto standard for single serve coffees in homes and coffee establishments. 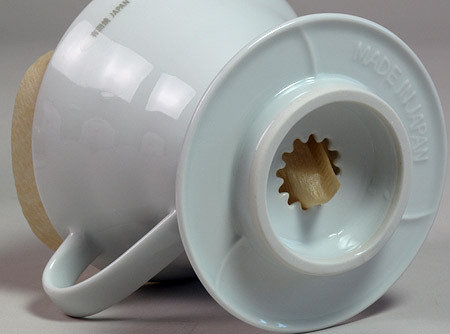 These Hario filter holders have a curved, swirl design on the inside to improve coffee flow. Prevents water from simply standing in the coffee bed. This design produces clean cupping coffee and avoids bitterness that is associated with an over extracted brew.